You are here: Home / Cooking / Shortcuts and Tips / Spice Cabinet Intervention Completed! 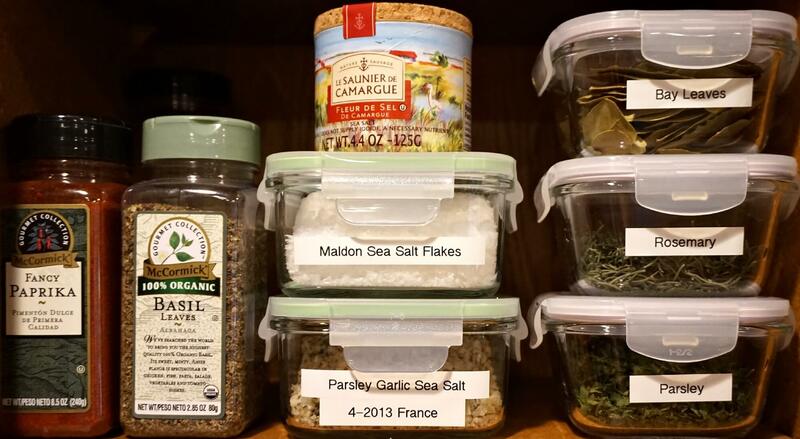 A well-organized spice cabinet makes preparing meals a lot less stressful, and saves you money. Can I hear a Ta Da! It’s really sad how happy a well-organized space makes me. Once I finished this cabinet, it was like a virus. I dug into two others. Now my life is complete. Until the next project that is. When I put out my Cabinet Intervention post, I found that many of us have the same problem. We don’t know what we have, and will re-buy the same thing two or three times. I asked for ideas, and boy did I get them! By putting everyone’s ideas to work, this is how my organization came about. We all agreed that similarly sized containers should be used, and some sort of organization by use was in order. Everyone pretty much separated their spices by baking verses cooking or sweet versus savory. The following people graciously contributed to the final result. Please stop and check out their sites for some fabulous food, photography, and friendship. 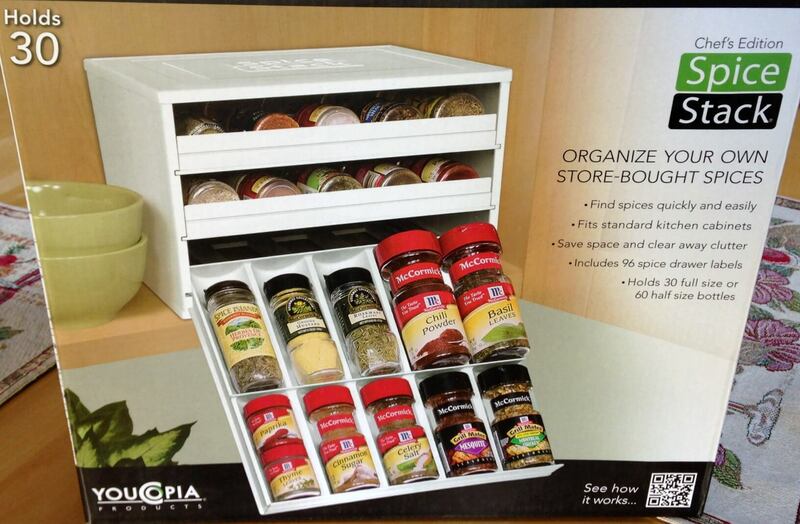 Patti from A New Day Dawns stated that she uses the Youcopia spice rack. My store didn’t have one so I ordered the larger one, after taking inventory of my spices, from Amazon. Rufus of Rufus’ Food and Spirits Guide also suggested that I add hardware for sliding shelves and door racks so that I could see everything. I think that would be an amazing idea but didn’t have the confidence that I could do it. This also brings up the fact that I am not 6 ft tall so the items that I used the most have to be accessible. I started by removing everything from the two cabinets. I separated sweet from savory. I threw out everything that I hadn’t used in eons. I then wrote down what I had and what kind of a container it was so I could determine what my needs were. I bought spice jars to condense open duplicate containers. I also stored unopened duplicates in another area. I had plastic bags that held the herbs that I dry. They are forever falling out of the cabinet. I solved this by putting them in a stackable glass container. 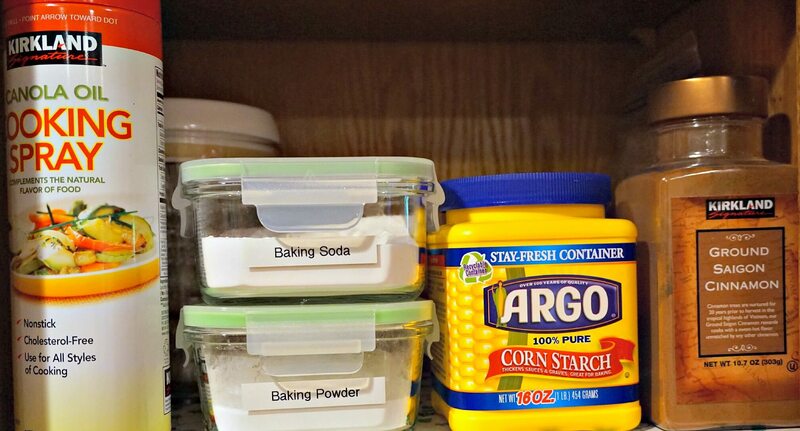 I always remove the baking soda and baking powder from their containers and put them in stackable containers. Now I know how much I have so am not buying extra or am not running out. I did the same thing for my salt. I have different kinds, and now they are all in similar containers. I’m singing now. Time to fill the YouCopia spice rack. I put the baking spices in the top drawer, and then everything else. I kept spices that are somewhat similar together such as my cayenne, ancho chili powder and chipotle pepper. 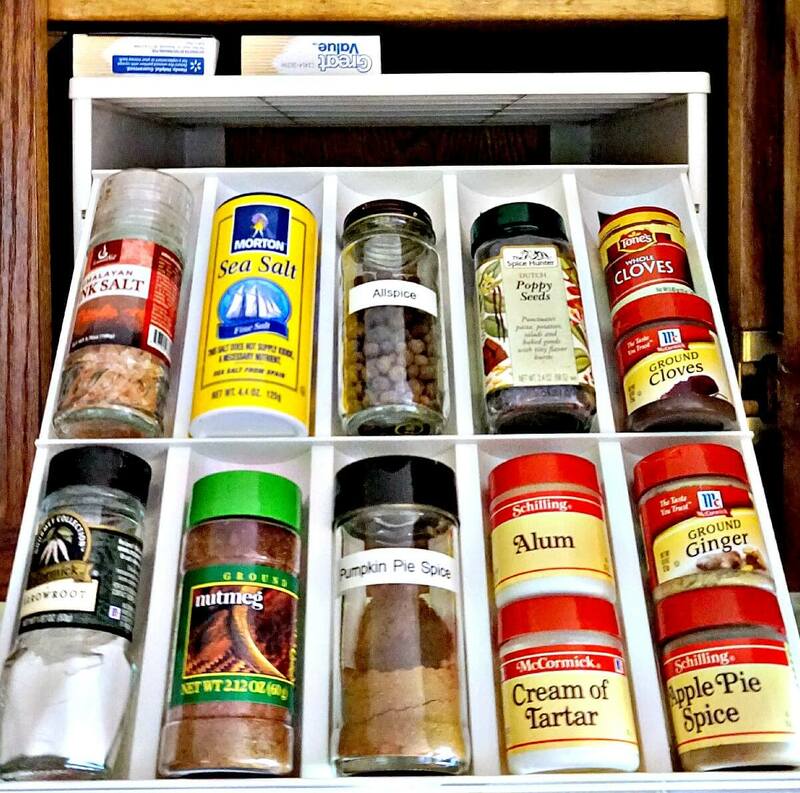 A couple of things that I learned was that the square containers stack and fit better in the cabinets, and going forward, I will buy my spices in containers that fit in the YouCopia Spice rack. I even have a bit more room. I think I will just leave the space empty. Too me it’s like having money that I don’t need to spend. I know, a little weird right? 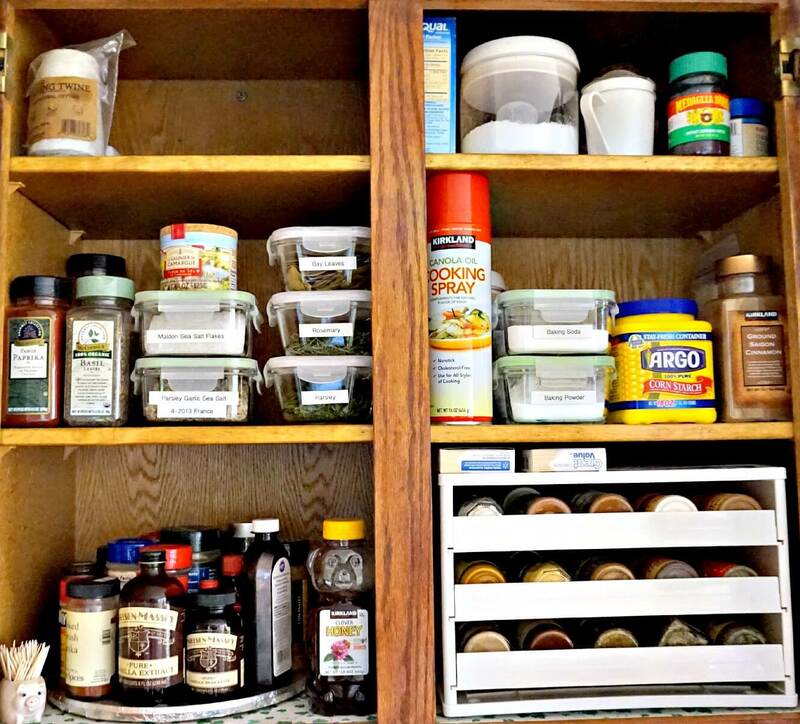 I hope this has helped you with your spice cabinet organization. Please contact me if you have any questions. Better yet, I would love love to see what you do! Mine are still organized and it is so much easier to cook when I know where my ingredients are. Thank you for visiting. After using it, I would recommend it. It’s not very heavy and I am careful with the drawers. I don’t know if they would hold up if hung for a long time with heavier jars . I do love an organized space though. Thanks for stopping Andy! I’ll come over, and you make cake! It would be fun. Impressive and great for grabbing spices in a jiffy. I love spice racks. What more can I say? You’ve inspired me to organize mine asap. Have a wonderful week! Thanks for stopping Liz! You have a great week too! Very impressive and super organized! 🙂 It looks great! Thanks Petra for helping me out with it! Thank you Shamim for taking the time to contribute to the post. I am pleased with how it cam out too. Enjoy your day! Awesome! I got inspired by your organization. Great tip about the baking soda in an air-tight container. I buy a big bag and use it for cleaning as well. Always cakes up in the container. And thanks for the mention! Thank you for your support! I was happy to get this done, but most of all, enjoyed working with everyone. This looks great. Neither of us are super tall and our cabinets are. Our step ladder is our friend! Thanks Nancy! I am very glad it’s done and pleased with how it came out. Thanks Sarah. I need to get in there soon too. I even thought about alphabetizing them. 🙂 I didn’t because I would have to rearranging everything when I threw something new into the mix. That would drive me crazy. You should see my wine cellar. 🙂 Thanks for commenting Jill! It’s great hearing from you. Thank you Ivy. It feels so good too not to have to search and guess if I still have what I need. Have a great weekend, and thank you for visiting! Julie, what you did here is absolutely a-ma-zing! You inspire me to do the same. All those containers are so pretty… Love it! My you really did a great job, One day I will do mine too. They are so well organized, looks great.